After hearing many enthusiastic stories about the extraordinary natural phenomenon of Perito Moreno, me and Vincent, both doing our internship at AMAUTA Spanish School Buenos Aires, decided to travel to the south of Argentina , to El Calafate. This cute little town is home to one of the most impressive glaciers worldwide: el Perito Moreno. El Calafate has become a very popular tourist destination in Argentina since the opening of their international airport. Not only for young backpackers and travelers, but also for Argentineans and travelers from other Latin-American countries. No wonder, because this is something you won’t find in many other places around the world, especially not with the current climate changes. 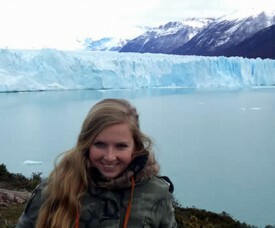 This makes the Perito Moreno one of the most stunning sites in South America. There have already been so many amazing and colorful celebrations in Cusco during the month of June, like for instance Inti Raymi. 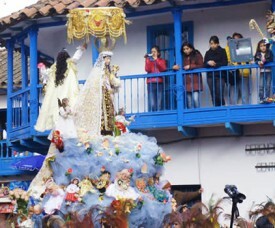 But we are not ready yet with the upcoming Festival in the Andean Village of Paucartambo: the Virgen del Carmen. For Spanish students, volunteers and travelers in Cusco, Paucartambo is the place to be on July 15 and July 16. La Fiesta of La Virgen del Carmen – by the local people also called nicely Mamacha Carmen – is a great colorfull happening with many music bands and traditional dances in awesome costumes. Brandon Sloan is a 29-year-old volunteer from New York City who has come to Cusco to make something meaningful of his travels to Peru. His volunteer experience at AMAUTA Spanish School has been fun, enjoyable and interesting as he works with kids at an after-school program. 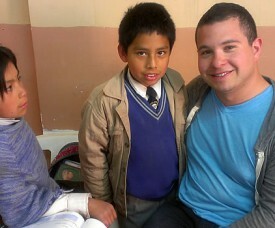 Each day from 2:00 to 4:30 he helps the Peruvian children with their homework, plays with them, and answers their many questions about how to say Spanish words in English.